24 volt DC UPS module keeps 24 volt equipment alive in vehicles and airplanes using an external sealed lead acid battery and acts as a battery back-up (BBU). 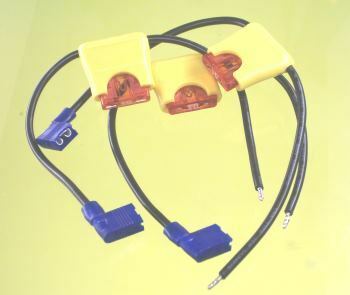 In-line fuse kit, consists of 2 in-line automotive spade fuse holders for the battery+ and load+ lines. Includes 10 amp fuses. This is a 24V DC UPS controller for use in trucks, busses, boats, and wherever a constant supply of 24 volts is needed. It allows equipment in vehicles to continue running when the power is temporarily interrupted by starting motor operation, or when you just need to run under battery backup with up to 10 amps, 240 watts nominal. In addition it controls the charge of the the auxiliary battery at 0.850 amps. First it allows you to safely charge an external lead acid battery from the vehicle electrical bus by isolating and current regulating the connection to the auxiliary battery. Second it isolates the extra battery from the vehicle so it won't be discharged by the vehicle electronics, and it won't try to participate in starting the vehicle. Third it powers your equipment in the vehicle using the vehicle electrical system, but switches to external battery power when the vehicle's battery is removed, stolen, or drops below a predetermined voltage. Fourth, it prevents the external battery from being overdischarged, keeping it from being damaged. Fifth, it prevents your equipment from running the vehicle's battery down so the vehicle can't be started. In one configuration it cuts off the vehicle's battery when the voltage gets below 26.2 volts, then switches over to the external battery, in other words, it switches over to the auxiliary battery when the engine is shut off and the alternator stops. In another configuration the crossover voltage is lower, say 24 volts. This allows your equipment to run off the vehicle's battery but cut off while the vehicle's main battery still has enough power to safely start the engine. Sixth, it prevents your equipment from losing power, powering down or rebooting while the vehicle is cranking the starting motor. 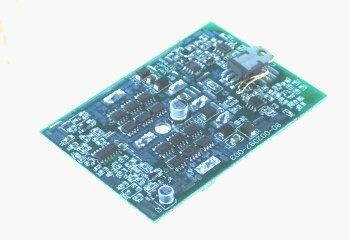 To solve these problems we invented this battery backup (BBU) charging board. The idea is that you can connect the module to the vehicle's electrical bus and it will charge an external 24 volt lead acid battery of your choice. Your equipment, which can be a computer, telemetry equipment, or a vehicle alarm, is connected to the module. This equipment runs off the automobile's electrical bus until the voltage of the bus drops below a preset voltage, the "N" voltage (from 27 to 18 volts, depending on your needs). Then the external battery takes over. When the external battery drops below the "P" preset voltage (Between 20 volts and 18 volts depending on your requirements) the power is cut off to either prevent damage to the external battery or to run your equipment as long as possible. This uninterruptible power supply control module is specifically designed to withstand the harsh electrical and temperature requirements of automotive equipment including spike, dropouts, load dumps, jump-starting, and high or low temperatures. Charge voltage The charging circuit is current limited, so the charge voltage can vary depending on the state of charge of the battery. The maximum charge voltage is 0.5 volts less than the vehicle's bus voltage. The vehicle bus' voltage must be higher than 25.8 volts to charge the auxiliary battery. The maximum vehicle bus voltage is 30 volts. Type of battery charged Lead acid, VRLA, SLA, etc. Status Connector There is a connection diagram below. 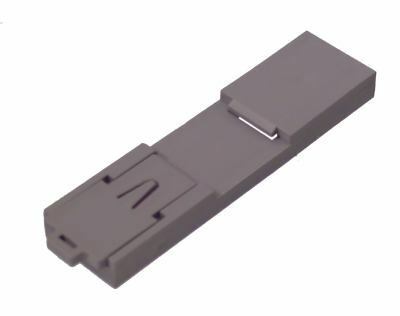 The mating parts for the status connector are: Connector shell = Molex 43645-0400 Connector pins = Molex 43030-009 or similar. There is a connection diagram below. 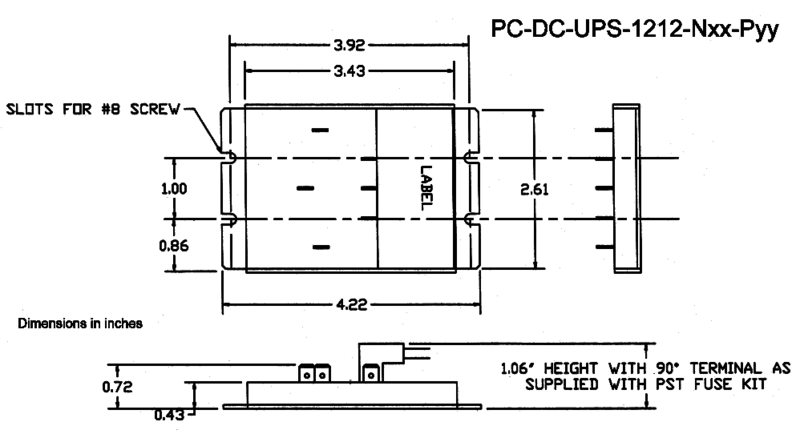 Formerly this was called the PST-DC-UPS-2424-10A can be ordered with a range of "N" and "P" values, as explained in the following table. Suffixes* Voltage at which vehicle battery is cut of from the load Voltage at which auxiliary battery is cut off from the load Why? N23.8 23.8 +0.1 -0 volts Allows the load to be powered by the vehicle battery most of the time but still start the vehicle (barely). P20 (most common choice) 20 volts When deep cycling of the auxiliary battery is desired. P18 18 volts When longest possible system operation is desired regardless of loss of auxiliary battery cycle life. This is what the circuit board looks like inside the fully potted module. 1. 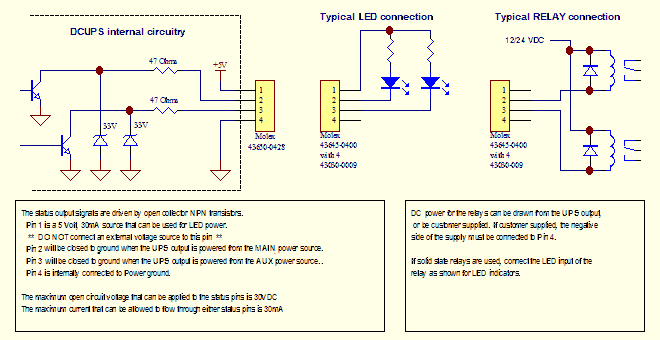 Q:My application needs more than 10 amps pass-through current, what can I do? 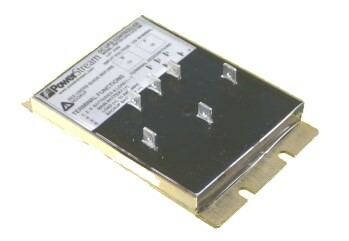 A: A 15 amp version is available, call and let us know your requirements. 2. Q: When the module turns off because both batteries are below their setpoints when does the module turn back on? A: The module turns back whenever the main battery or auxiliary battery is greater than their N or P values (this is an improvement over the 3 amp UPS module which turns on only when the vehicle exceeds its N value). 3. 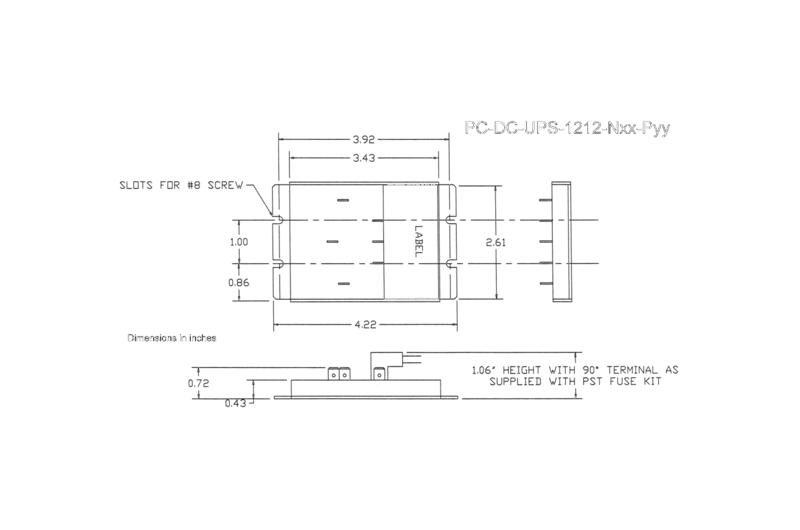 Q: What do you have for 12 volt systems? 4. Q: What is the recommended fusing? A: If you fuse both the input positive and auxiliary battery positive with a 15 amp fast blow fuse the module will be protected from reverse polarity and short circuit conditions. 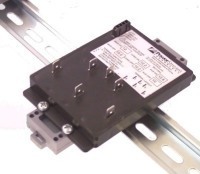 In addition, if the load can source current it should have a 15 amp fast acting fuse as well. 5. Q: I am charging a very small battery with this, the 850 mA charge rate is too high according to the battery manufacturer. A. The charge algorithm used is kind to the batteries even when the maximum charge rate is over the C/3 rate specified by the battery manufacturers. For more information click on this link.